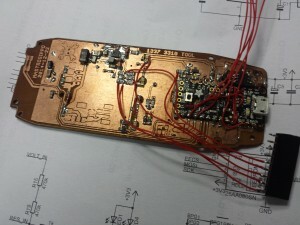 This article is part of a larger project to build a multi-purpose board that can replace a Nokia 3310′s mainboard. I also had to add a bodge flyback diode to the buzzer, as I forgot to include one… That’s the second error on the PCB: the other one is taking for granted that I could put two green LEDs in series. I’m too used to modern, super efficient LEDs, but since I’m reusing the original Nokia 12 years old LEDs, they need a bit more current and seem to have an higher forward voltage than the ones I use everyday. Previous Post3310 PCB designNext Post1337 3310 tool demo video and sources online!